The consoles of this sectional feature plenty of storage space. Pick from Stainless Steel or Antique Bronze. 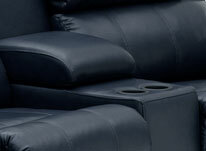 Choose between either recline solution and get in the right viewing position! The Palliser Dallin sectional blends class with relaxation for a deluxe home theater experience. The seat not only features plush, overstuffed headrests but thickly padded armrests, for a double dose of body comfort. Reduce neck and shoulder strain on the upper body as you sink into the Dallin's supple folds. A full chaiselounger eliminates the gap between seat and footrest for a similar cushion of support to the lower body, while hidden storage compartments in the armrests provide plenty of space for remotes, snacks, reading materials and anything else needed for a complete entertainment experience. Customize the seat into two-seat, sofa, and L-shape configurations, and choose from hundreds of material and color options to fashion a media sectional for the 21st century. Quality and Exceptional Value. Palliser Furniture has maintained its tradition of excellence for over sixty years. Creating well made, quality home theater furniture requires dedicated people, and behind every piece of Palliser furniture are many skilled hands and creative minds. At the Palliser Furniture drawing board, the design team is passionate about the subtleties of style. Collections reflect a carefully considered selection of pieces that represent quality, feature extensive choice and impart innovation. Developers carefully source and test materials to meet Palliser Furniture's high standard for durability, safety and value. In Palliser Furniture's manufacturing plants, engineers and assemblers skillfully produce the astounding variety of upholstered products that are offered by retail stores, and are selected for your home. Fabric material offers a wide array of texture, color, and pattern options along with a warm, inviting ambience that exudes down-home comfort. The texture of this material can feel like cloth, suede, velvet, burlap, and even leather, depending on its construction. Larger and smaller grains, stitching, and patterning give each fabric its own particular style; with 180 different options to choose from, you are certain to find something which matches your needs. Grades 1 and 2 of Palliser's fabric line focus on solid color options, with variations in grain (if intended to mimic leather) and stitching (especially with burlap-like styles). Grade 3 of the fabric line focuses exclusively on stylish patterning, in a dazzling array of styles that range from floral, art-deco, and paisley to idiosyncratic geometric designs based on circles, diamonds, and chain-link artistry. Be sure and examine the many styles that are available and spend time in choosing the one that's perfect for you. Bonded leather combines the look and feel of genuine top-grain leather with an affordable value, for a presentation that many home theater seat owners find irresistible. This material is a polyurethane-leather hybrid, designed to incorporate the best of both worlds. Polyurethane gives it a consistent sheen that is even easier to maintain than full-grain leather; a light wipe-down with a damp cloth is enough to keep it looking radiant for years. Meanwhile, the leather content of this material imparts the appearance, texture, feel, and even scent of full-grain leather, for an opulent finish. Grades 1000, 1500, 2000, and 2500 are available in a leather match option, in which the backside and underside of your home theater seat is fashioned with a durable vinyl which is carefully matched in appearance to the leather on the front. This option provides the benefits of leather seating, with a great value. This top-grain grade of leather is known as "corrected", in that it is buffed to remove imperfections. A surface grain is then applied for a smooth, polished finish. This grade of leather is among the longest-lasting and easiest to clean, making it a perfect choice for those with kids or pets. The colors of this leather are generally solid, for a bold look. This grade of leather is "semi-corrected", which means it is lightly buffed to remove blemishes, while retaining some of the natural look and texture of the original hide. It is similar to Grade 1000, in both its smooth surface grain and easy maintenance. Solid colors are common with this grade, which is also very stain-resistant. This brand of semi-corrected leather is similar to grade 1500, but comes in both solid and two-toned color options. 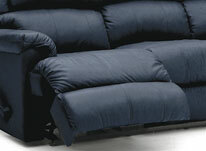 The natural softness and durability of this material is combined with a great value. This brand of semi-corrected leather comes in three different styles, each with color options ranging from solid to two-tone. It is similar to grade 2000 in that it is soft, yet stain-resistant and retains some of the natural texturing of the hide. This brand of top-grain leather is "uncorrected", which means that it is exclusively chosen from natural hides with few blemishes (what markings there are, are not imperfections but proof of the material's authenticity). Natural top-grain hides are exceptionally soft, with the thick texture and strong aroma that will tingle your senses in turn. This grade comes in several color options ranging from solid to two-toned, with some featuring a slightly larger grain pattern. This grade features all the benefits associated with uncorrected top grain leather, including silky softness and thick texturing. The color options range from solid and two-tone styles, to various high-gloss shades that boast a smooth, polished surface. This grade of uncorrected top grain leather is one of the softest on the market, chosen from only the finest hides. 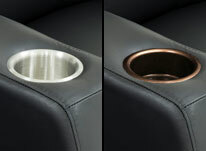 Its thick texture and shaded color options make it an instant standout, to be used in the finest luxury seats. This all-natural uncorrected top grain leather is similar to the 5000, in that it retains all of the beauty of the original hide. An aniline dye is applied for color options, while carefully retaining all of the characteristic markings and grain pattern of the natural surface. The regal appearance and supple texturing of this grade is highly prized, which readily absorbs moisture and oils to develop a rich patina over time. Blown fiber back cushions with 11 or 12 gauge sinuous springs which are engineered to provide lasting comfort and strength. 1.8 lb high resilience foam for superior comfort without loss of support and 8 gauge sinuous wire springs for superior ride and comfort. Toggle switch for power operation on the inside of the armrest. Hand wand for power operation of armless seats. Pull latch on the inside of the armrest for manual operation, & D-pull parachute style handle for manual operation of armless seats.